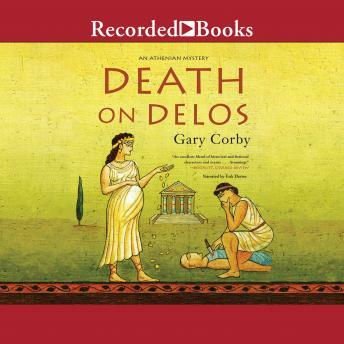 Greece, 545 BC: It is illegal to die on the sacred isle of Delos. It's also illegal to give birth there. Yet when murder is committed, the only available detective to solve the crime is the priestess Diotima, and she is heavily pregnant. Delos is the holy birthplace of the divine twins Apollo and Artemis, and it is an island in crisis. Not only has murder tainted the holy sanctuary, but there are about a thousand Athenian troops on the island. The army is led by the statesman Pericles and has come to take away the treasury of the Delian League, the defense fund of the Greeks against the Persian Empire. The holy people are in uproar. The Athenians are exasperated. The High Priest of the Delian Apollo is not amused. To cap it off, Diotima's husband and fellow detective, Nicolaos, is implicated in dodgy dealings that link him to the murder. Somehow Diotima must find the killer, calm the island, and.oh, yes.have a baby.